When painting around a window, we use masking tape to keep the paint from getting on the glass. 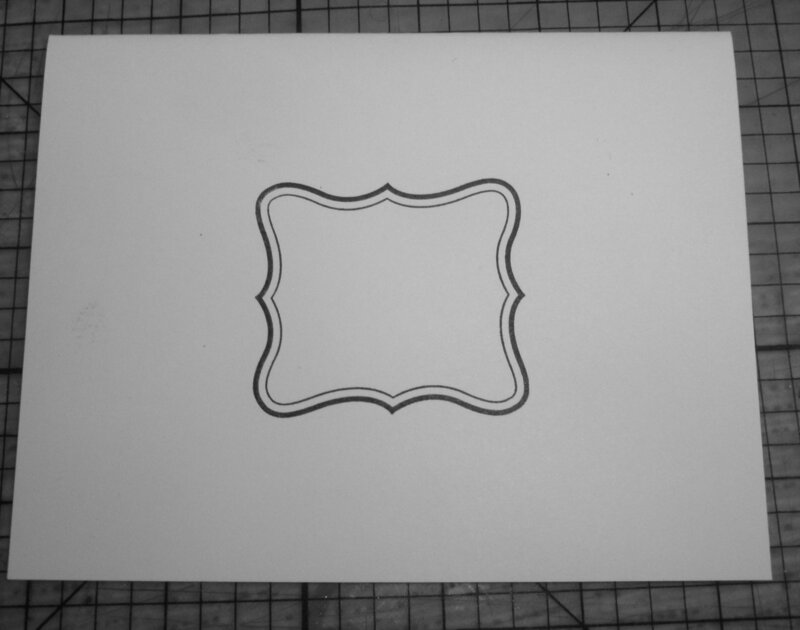 Just like that tape, in card making the term"masking" describes covering one part of the card to keep from stamping or inking on it. In future tutorials we will demonstrate more advanced masking techniques. For today we will introduce the basics. 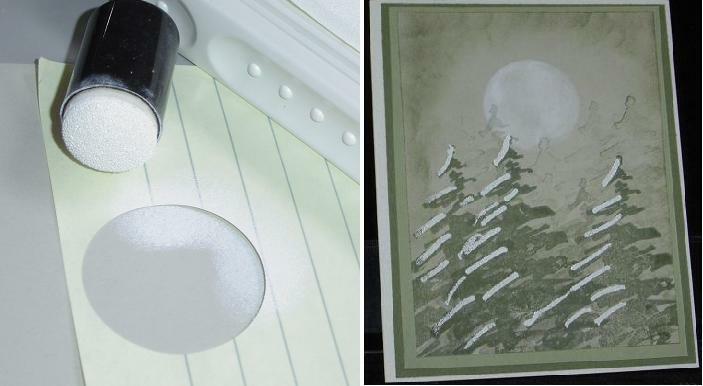 Here are two cards on which I combined masking with sponging to create a moon. 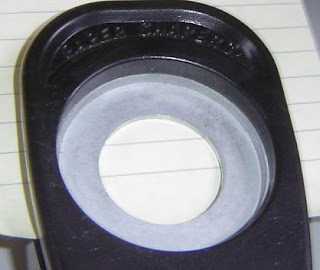 I punched a 1-1/4" circle out of the sticky part of a post-it pad. 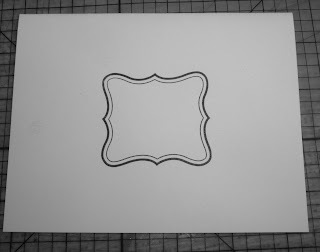 I like to use a sticky-note pad for masking, because it is easy to reposition without leaving a mark on your cardstock. On the first card I'm using the circle that I punched out. After sticking it to the cardstock I sponged all around the circle with pumpkin pie ink. In this card the un-inked circle is the moon. On the second card I used the hole the circle came out of. 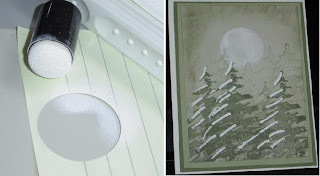 After sticking it to my cardstock I sponged inside the hole with white craft ink. On this card the inked circle is the moon. 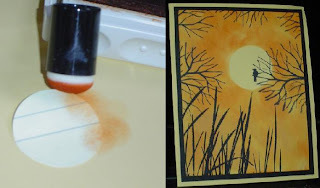 To illustrate masking with a stamped image, Julie captured these steps for us. Thanks, Julie! 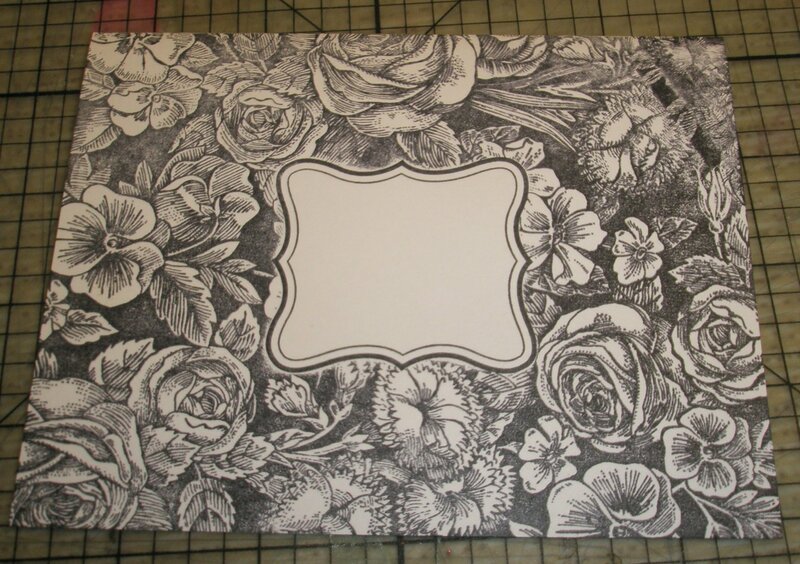 First, on her white cardstock background, she stamped a frame for her sentiment. 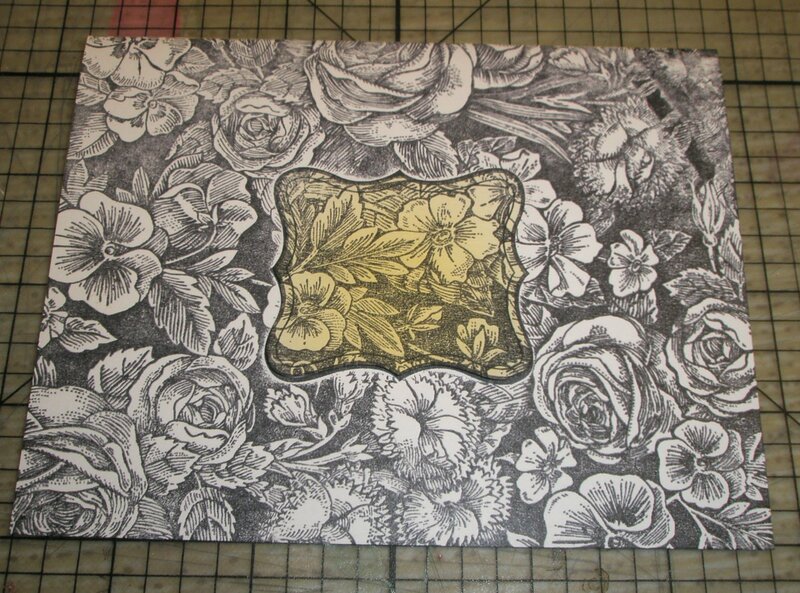 She stamped a second frame on a sticky note (colored yellow for easy visibility) and punched or cut it out to cover the stamped frame. 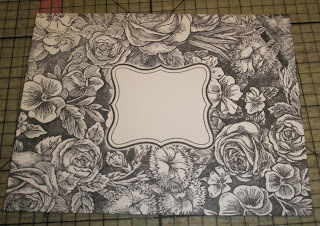 After covering the stamped frame, she stamped the entire card with a floral background stamp. The mask is removed to reveal the un-inked space for her sentiment. 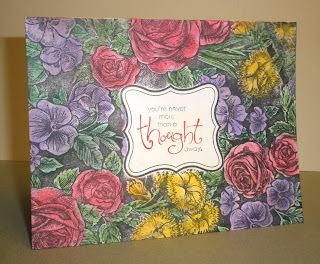 Add sentiment and color, and what a pretty card! Please leave a comment or send an email to challenges@operationwritehome.org to give us feedback or suggestions for future tutorials. If you would like to submit a tutorial, or provide photos for a specific technique, please include that information as well. 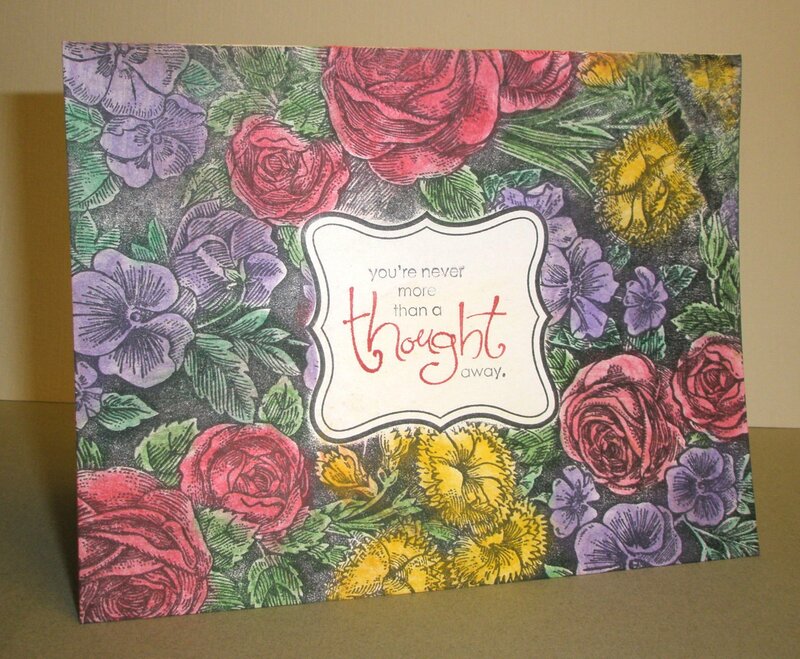 Sandy, the cards you made using masking are awesome! And Julie's, wow! Thanks for revisiting this technique for some of us and opening up a whole new world for others! All of the cards are just stunning. Seriously. I'm in love with the moon cards, and the flower card us amazing (LOVE the stamp and LOVE the look in B&W). Thanks for sharing! Thanks for the tutorial. I've never done masking, but I'm slowly working my way through the tutorials and challenges (although not always on time). It's great motivation! Thanks for the tutorial. While my DD has often told me how to do this, by the time I get home, I forget. Now all I have to do is look back at the tutorial! Great tutorial! Where do you get those sponges? Thanks for the great feedback, y'all. Those of you who are new to masking, be sure and link us when you try it out. 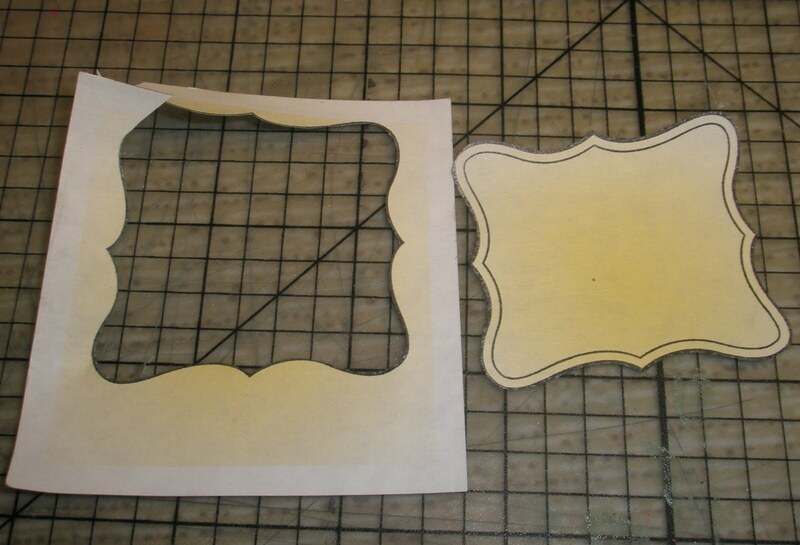 JoAnne - Those are called sponge daubers and I got mine from Stampin' Up! but I know other people sell them. In fact, I'm sure they have them at scrapbook.com. All the cards are great. I especially love the last card. Wow, I hadn't thought about coloring in that stamped in before. Thanks Kate! 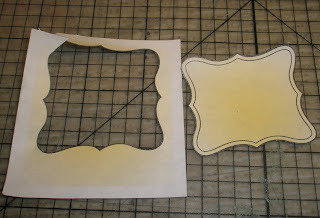 And lucky for me I've got a Stampin Up party coming up this weekend so I'll be able to get a sponge dauber for myself! Thanks again! 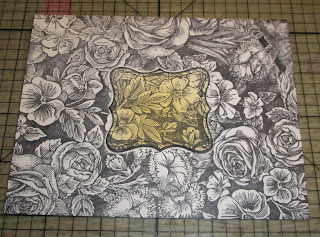 I tried this technique the day after I read it and used it to make two different cards for Operation Write Home --- I don't know how to send you the photos, but they can be seen at Stamp Haven's Gallery - under Ann Lickey Now to try some different ideas. Thanks again for the great Tutorial. Great tutorial. Short, sweet and straight to the point.